Microsoft Outlook users, this article is for you! We bet you like your Outlook and use it for everything email on your computer. Indeed, it’s terrific and you probably like the fact that all your mail is in one place and that it can be organized in any manner you like. Plus, it’s all on your computer and no one else has access to it. If there’s a need, everything can be backed up and then transferred to any other computer or storage medium. All of your important contacts, calendars and note are in one place too. Outlook seems to be a great option and it’s very user-friendly once you figure out how to use it. It acts as a desktop email solution and you surely know that files on your computer can be easily deleted or damaged. It can happen any time, when you least expect or after you do something on purpose and then, regretfully, want to get it all back to where it belongs. So how do you recover Outlook? At first glance it seems impossible because Outlook cannot offer you any decent restoration tool (if any) and what you should do is to look for other options. Recovery center? Maybe a good decision but are you really willing to spend a lot of money on it? If you are and you don’t care how long it takes, go ahead, but we have to warn you, it probably won’t take a couple of minutes, the time your computer will spend there can count in days at the least. If you’re the busy type and like facing the challenge yourself, without help, we suggest you try one of those recovery programs that have flooded the market. You can choose freeware and try it but we recommend sticking to time-proven solutions, like Easy Outlook Recovery, for instance. The program is quite effective at dealing with what it was developed for—Outlook recovery. With its help you will not only recover a couple of messages but your whole PST database, providing it hasn’t been overwritten. Since it’s hard to say without looking at your data, how much damage there is, you should try the program on your computer. Should you decide that it works, you are encouraged to buy the license key. There are three license types—Personal, Business and Service, you can read about each of them on our website and download the free trial of Easy Outlook Recovery. 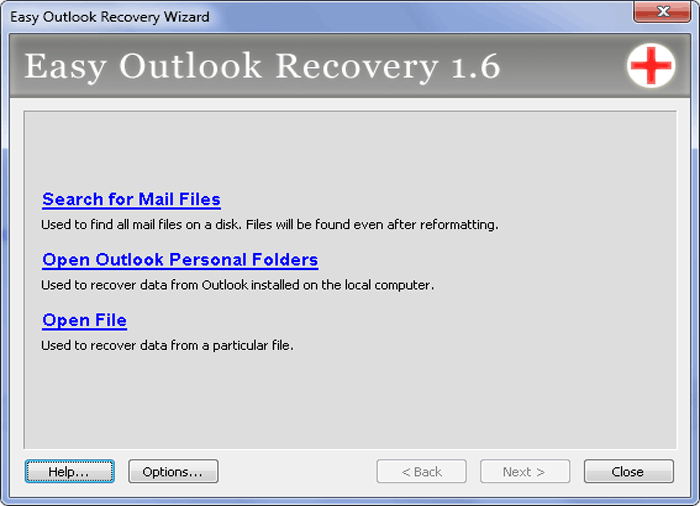 If you decide to buy the program, no other problems with Outlook recovery will have any significant impact on you from then on, all you will need to do is to run Easy Outlook Recovery and quickly restore your emails.